Roman turned to her church for help finding a lawyer and community members who would volunteer to accompany her dad to immigration court. She vowed to find a way to support other people facing deportation and family splits. That vow helped spark what are called rapid response networks — which are now being replicated in other cities across the US. These organizations are springing up especially as the Trump administration pushes to ramp up deportations, targeting "sanctuary cities" — those it accuses of limiting cooperation with federal agents to shield undocumented immigrants — in particular. At their core, the networks include hotlines where people can get urgent legal advice if immigration agents are at the door — and volunteers ready to come witness arrests, and support families afterward. Lorena Melgarejo, with the San Francisco Catholic Archdiocese, is also helping build the networks, working with the PICO National Network. Melgarejo says the networks expand on the the "idea of sanctuary churches being inside of the walls of the church" and taking sanctuary to the streets. Volunteers for the networks are typically trained at local churches. 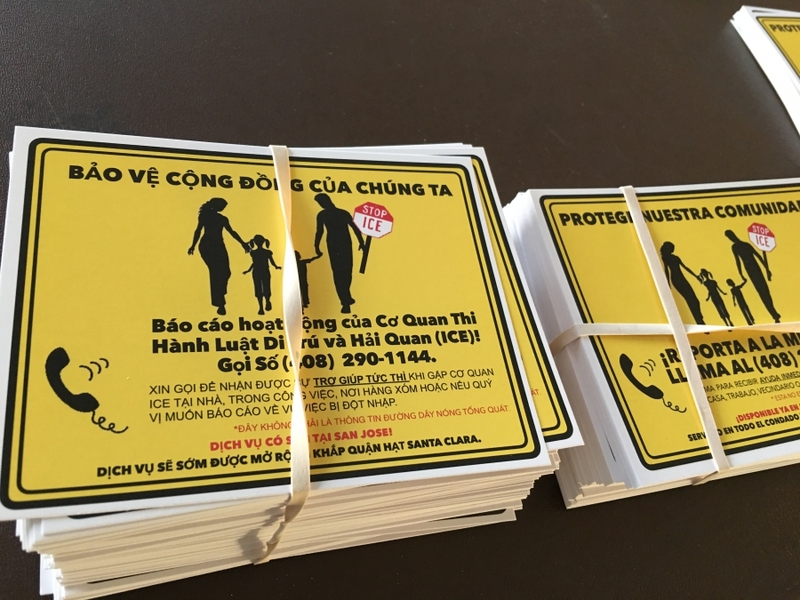 Recently, one training took place in the evening at St. John Vianney Catholic Church in San Jose, on the east side and heavily immigrant part of the city. The training kicked off with about 50 people sitting in folding chairs. Immigration lawyer Celine DinhJanelle starts the training going over basic rights if ICE agents knock on someone’s door. “What rights do you think that immigrants have in raids?” she asks the room. There is a slight pause. Someone mentions the right to remain silent, to not answer the door. Then it is on to how volunteers should respond if they get a text message that ICE officers may be arresting someone nearby, at their home or work. Volunteers also learn about taking on different roles once they arrive at the scene — taking video and notes. Then, the group role-plays. One volunteer pretends to be an immigration agent, while others pretend to show up. But it’s one thing to practice this at a church. It’s another to be on the street when an arrest is actually happening. Jesus Ruiz, one of the trainers, recommends caution. "When you get out of the car, have your phone out already, and have your pencil or notepad out already," he says. "The last thing you want to do is be approaching ICE and reaching in the back pocket for your phone. Especially if you’re a person of color, we do not recommend that." The rapid response trainers are also clear what this group is not doing. "We are not trying to stop a deportation," says Ruiz. "We are not going to interfere with ICE because we are putting ourselves in danger of being arrested if we’re trying to push ICE away or barricade around an ICE mobile or something like that." Volunteer Patty McDonald, an elementary school principal, says she is ready. "I work with a lot of immigrant families through my job," she says. "Children telling me that their parents are afraid. I feel hopeful that there’s something I can do rather than sitting worried and angry, and I feel like I can be part of something that will support them." How would she feel jumping in her car at 5 a.m. and rushing over to witness a possible ICE arrest at a neighbor's home? "That is something that I can do and I would like to do that to support my community," she says. For Roman, whose father was arrested by federal immigration agents, the networks also mean closing a gap. She says that she knows people who have been deported, but adds that is not the case for many of her neighbors in San Francisco. "It’s not the same hearing about what’s happening than seeing it up close," she says.